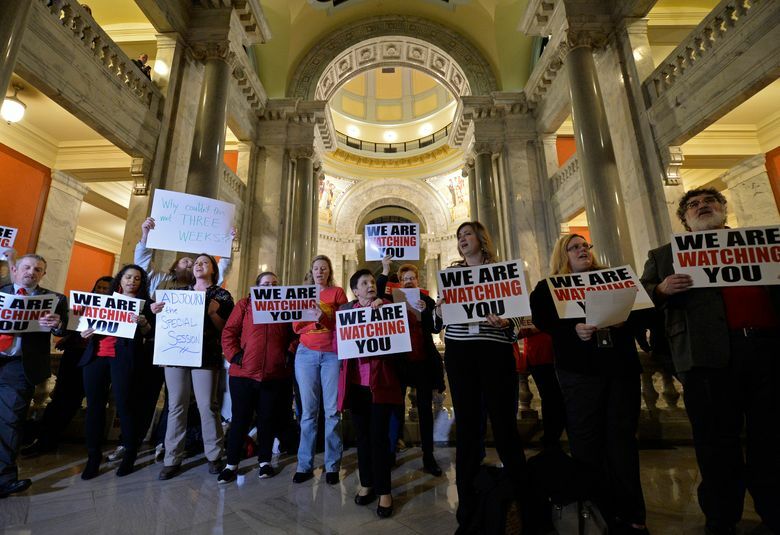 FRANKFORT, Ky. (AP) — Days after losing at the state Supreme Court, Kentucky’s Republican governor called the legislature back in session Monday to try again to reshape the state’s troubled public pension system. Surprised lawmakers from both parties scrambled to make it to the state Capitol for the 8 p.m. start time. 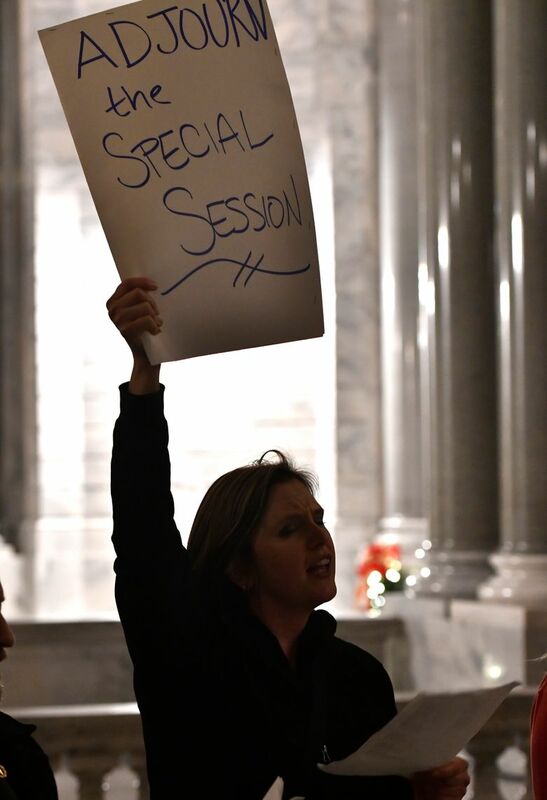 After hours of closed-door negotiations, the Republican-controlled House of Representatives introduced two bills written by Bevin’s office that would overhaul the pension system and adjourned for the day. They plan to debate the bills this week. 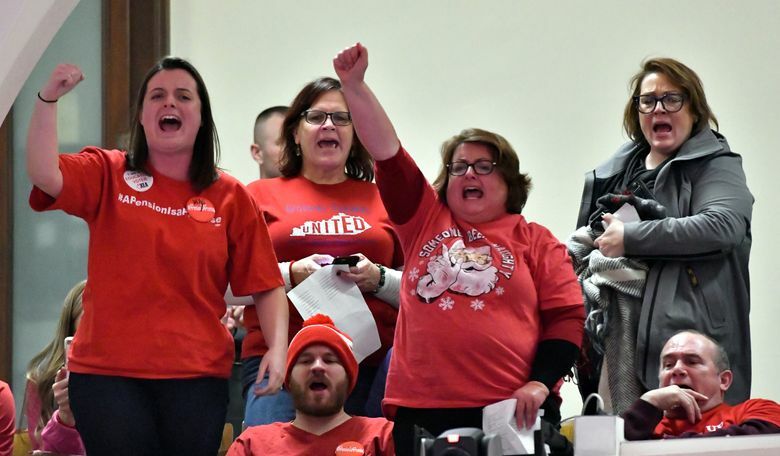 “I don’t care what it takes, we will show up and we will make our voices known no matter what the cost,” Kentucky Education Association President Stephanie Winkler said. Kentucky has one of the worst funded public pension systems in the country. State officials are at least $38 billion short of the money required to pay retirement benefits over the next three decades. Earlier this year, the Republican-controlled legislature passed a law that made changes to the pension systems, including moving all new teacher hires into a hybrid plan, restricting how teachers can use sick days to calculate retirement benefits, and changing how the state pays off its pension debt. While the law had little impact on current employees, teachers were outraged at the speed in which lawmakers passed the bill in the final days of the legislative session. Lawmakers introduced and passed the bill in just over six hours. Democratic Attorney General Andy Beshear, Bevin’s political rival who is also running for governor in 2019, sued to block the bill. He argued the legislative maneuver lawmakers used to pass the bill so quickly was unconstitutional. Thursday, the state Supreme Court unanimously sided with Beshear and struck down the law. While Bevin has the authority to call lawmakers back to the Capitol, he can’t force them to vote on anything. Lawmakers could adjourn the session and take no action. In a brief news conference announcing the decision, Bevin said he has had “remarkable amounts” of conversations with Republican legislative leaders over the weekend but did not say if they had come to an agreement. Republican state Rep. Jerry Miller sponsored both bills introduced on Monday. He said the proposals are largely what lawmakers passed earlier this year, plus one new proposal from Bevin that would eliminate a more generous benefit calculation for teachers with more than 30 years of experience. Miller said he did not expect that proposal to pass. “We are trying to help. We’re trying to rescue the system,” Miller said. Republicans have super majorities in both the House and Senate, totals that were unchanged by the midterm elections. 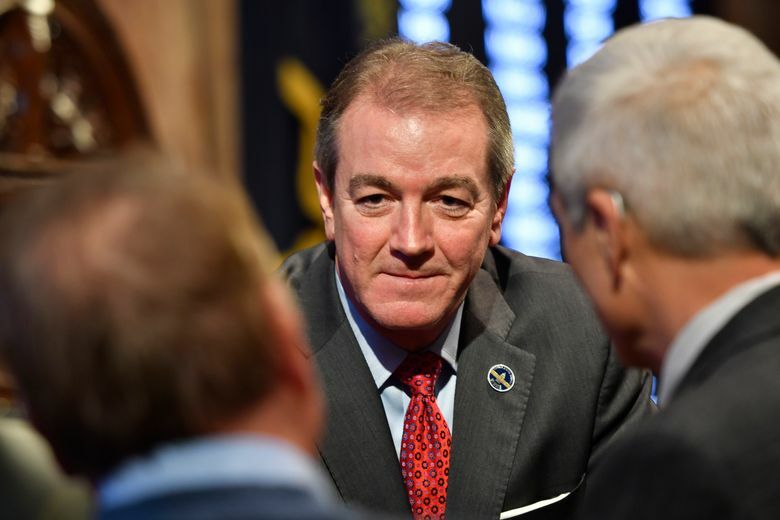 Acting GOP House Speaker David Osborne said lawmakers had “very little input” in the timing of the legislative session or what was put into the bills. He made no promises that they would pass, saying he expects lawmakers to examine the proposals closely beginning with a committee hearing on Tuesday afternoon. “Where that process will lead us as far as changes, whether we actually even take the legislation up, (is) yet to be determined over the next couple of days,” Osborne said. 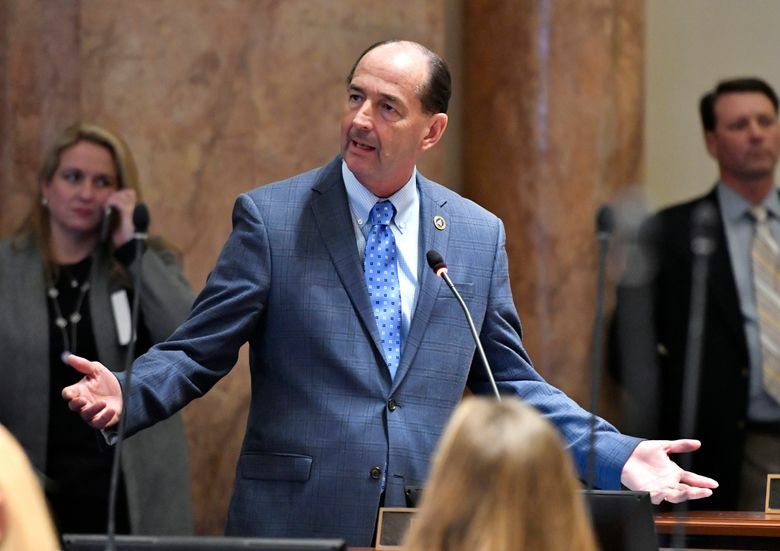 House Democratic Leader Rocky Adkins pointed out the state legislature was scheduled to convene on Jan. 8th for a regular session. He questioned why Bevin would call lawmakers back for an expensive special session that cost taxpayers at least $65,000 per day. “I just think basically it’s an abuse of power,” said Adkins, who is running for governor in 2019. 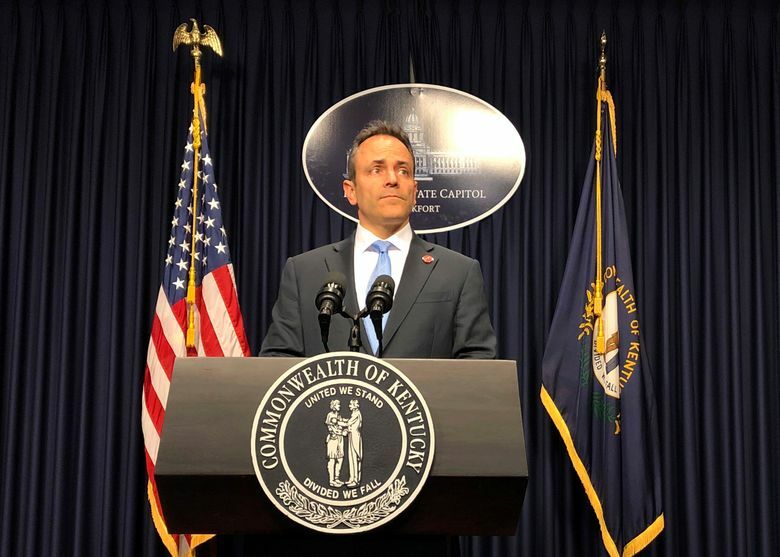 Bevin said urgency was needed because he believed credit rating agencies are preparing to downgrade the state’s rating in response to the Supreme Court ruling.